I found these ornaments at my sister’s father Rae Hoff’s farm in Comanche, Texas. (We are half sisters, we have the same mother and different fathers.) 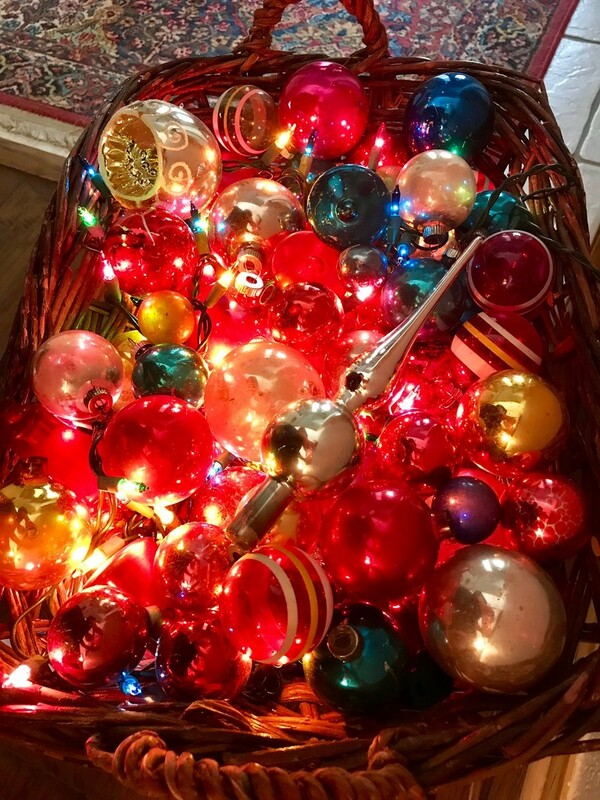 He had stored all of his wife’s Christmas decorations in an outbuilding on the farm after she passed away, a real treasure trove of Shiny Brite ornaments, I’ll tell you! No one in the family wanted the ornaments, so I happily brought them home, threw away the brittle, falling apart boxes and piled them in a basket with small twinkling lights. They sit just inside my entry hall every year, I love them. What a delightful idea - the baubles with the twinkling small lights make a lovely welcome in your hallway ! These are wonderful and I recognize some of them from my childhood tree - thanks for sharing! A wonderful display. Great idea for recycling the baubles. What a lovely story and a great keepsake. Thank you for your wonderful comments! I have to tell you my sister is jealous of my basket of ornaments, every time she visits during the holidays she says she is sorry she didn’t think of making this display. Since I’m the little sister I’m not about to give in and give them to her. 🤓 You put this on the TP and PP, thank you!!!!!! She would be so happy to know you are still displaying them - good for you, Lou Ann! A lovely treasure. They are always beautiful. Such a wonderful use of extra ornaments. Fav! They are so colorful and cheery- what a treasure! Thank you for your comments and favs! And @gazzatron you are right, I’m reflected in several of the ornaments, lol. So glad you rescued them. They are lovely, and especially precious since they are family.